Sherbrooke, QC – For the first time in the 2018 CIBC Canada Russia Series, Russia is in control. Four QMJHL additions and a 33-save performance from Pyotr Kochetkov powered Russia to a 5-1 win in Sherbrooke, giving them their first series lead to this point. San Jose Sharks prospect Ivan Chekhovich (Baie-Comeau Drakkar) earned Player of the Game honours for Russia with a goal and an assist while Pavel Koltygin (Drummondville Voltigeurs) and Alexander Khovanov (Moncton Wildcats) both had a pair of assists. 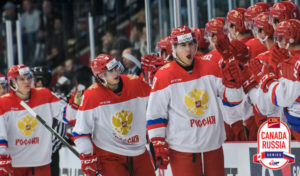 Calgary Flames pick Dmitry Zavgorodniy (Rimouski Oceanic) rounded out Russia’s QMJHL quartet with a goal in the win as the opportunistic Russians struck for five goals on just 17 shots. “The effort was there, but obviously it’s not the result that we wanted,” said Team QMJHL head coach Jim Hulton post-game. “I thought we had trouble getting some momentum. We gave up the early goal. I thought we started out and had some good legs and then we were chasing the game a little bit at 1-1. The turning point was that third goal. If we get out of the second period at 2-1 I think our legs and our energy are there but unfortunately they capitalized. The line of Koltygin alongside Ivan Muranov and Nikita Shashkov worked wonders early, opening the scoring with Shashkov’s first of the event 3:03 into action. After Team QMJHL captain Pierre-Olivier Joseph (Charlottetown Islanders) drew the score even on a wrister from the point, Russia re-established the lead with four minutes left in the frame as Muranov displayed some quick hands from in tight to beat Matthew Welsh (Charlottetown Islanders) to the backhand. Team QMJHL outshot Russia 13-3 in the middle stanza, but solid netminding from Kochetkov paired with a late goal from Zavgorodniy from Khovanov and Chekhovich wiped out any momentum the QMJHL had gained. Kirill Slepets and Chekovich scored within a minute of each other just beyond the midway point of the third to put Russia up 5-1 and that’s the way things would stay as Russia climbed into a 9-6 series lead in points headed into Thursday’s series finale in Drummondville. Kochetkov becomes the third Russian goaltender in event history to earn three wins in a series as Russia has now outscored the CHL 14-7, holding the three leagues to a collective 0-for-16 mark on the power play. The five goals are the most Russia has scored against the QMJHL in the event since 2012. For the second straight year, Game 6 will decide the series.